Anyone who has owned a restaurant with a generous bank of windows that solar heat gain can present a major issue for restaurants. Maintaining a consistently comfortable dining room temperature can feel like a game with no winners. With the windows uncovered, direct sunlight can keep your climate control system working overtime and create uncomfortable hot spots. Keeping the curtains drawn can create the wrong atmosphere though, making your dining room feel drab and dark. The easy answer for managing sunlight and solar heat gain in restaurants — retractable awnings — which may be the reason behind their growing popularity. During the hottest, brightest part of the day, restaurant staff can extend awnings to block direct sunlight like the long, gently sloping eaves of traditional Japanese architecture. This creates a deep border of cool shade without interrupting the view. As the sun changes position, awnings can be retracted to catch the last bits of daylight. It’s important to remember that you need to choose a fabric engineered longevity and consistent performance to maximize the lifespan of your design. Retractability requires ongoing folding and rolling that will quickly degrade cheap fabric. Choosing a textile that’s formulated to maintain plasticity over time is key, no matter if you want to use a crank-drive system or alternative solution. Over time, cheap fabric that isn’t properly UV treated will become brittle and stiff due to sun exposure, which makes it more likely to crack or tear. In order to maintain flexibility, your awning should use a vinyl like Weather-Chek that’s formulated with high grade polymers. The area where your project is located can have a big effect on which awning designs will have a viable use-life and which will be in tatters after as little as a single year in place. Awnings that aren’t designed and constructed for the climate they face — whether that is heavy wind, moisture, snow and ice, or relentless sunshine — will quickly wear out and need replacement. Obviously, requirements will vary from region to region. Applications that are well suited to dry climates like Southern California won’t fare well against the wind, rain, and snow of the Northeast. In damp environments like the Pacific Northwest, awnings should be designed to prevent water pooling and resist mildew. 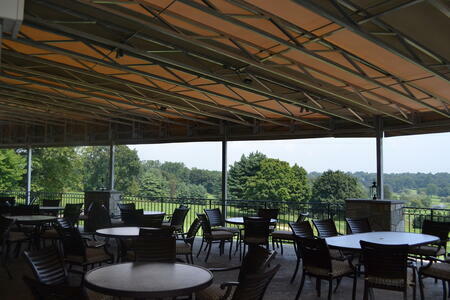 Every awning should be designed to withstand unexpected periods of high wind. Customers often choose restaurants based on their exterior. When you design awnings that quickly fade and fall apart, you are driving away customers in the process. Restaurant awnings can play a key role in the style of a restaurant exterior, reinforcing the color and design vocabulary and serving as de facto signage. How often have you gone to an unfamiliar restaurant solely based on the look? A stylish, clean, and vibrant awning lends an air of sophistication to a building, which let’s the prospective diner know they are in for a five star experience. There are definite dos and don’ts when it comes to awning design, and a lot of them come down to material. Awning design needs to fit with the restaurant's overall brand. Sounds easy, but the material you choose will make a big difference. Vinyl fabric is the easiest to maintain and keep looking clean. Canvas fabric made from cotton or natural fiber blends tends to get dirty quickly, and it requires more upkeep to stay vibrant. For the natural look of canvas with better resilience, consider a product like Weather-Chek, which combines a natural woven aesthetic with its rugged waterproof and UV-proof coated vinyl formula. UV protection is especially important for restaurant awnings. Textiles that aren’t coated for sun protection will become damaged over time, which results in fading, brittleness, cracking, and tearing. A faded and ripped awning above your front door does not whet the appetite of prospective diners. 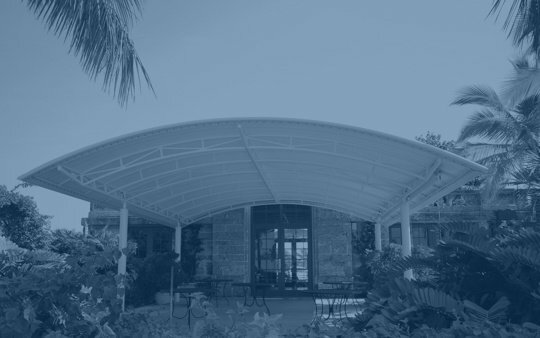 See how you can minimize maintenance costs and improve durability for your external structures by using Herculite awnings.